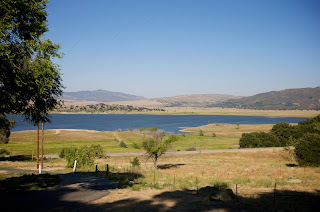 The second part of our vacation is cabin-camping at Lake Henshaw, about two hours outside of San Diego. I knew I wanted to take the kids camping, but while tent-camping is great fun for a few days, trying to live with two little kids for six days in a 2+ man tent, cooking in the dirt, and taking cold showers was not my idea of a relaxing vacation nor a quality bonding experience with my offspring. So I started looking for cabins to rent. The Lake Henshaw Resort seemed like a nice option, as it's on a lake (obviously) and far enough from civilization to be calm, quiet and relaxing, but less than an hour from a major city should we grow tired of dirt, bugs and fresh air. …and in fact, very likely had taken a photograph of the Lake Henshaw sign already. A bend in the road with sweeping views of the valley below confirmed it; this was the spot where Team Type 1 had first overtaken Team Vale in the Race Across America in 2006 (a cat-and-mouse game that would continue for the next five days all the way across the country), and I had stood at a particular bend in this street overlooking this vista shooting the team on the first of many impressive climbs, getting lucky in the process and capturing the first leapfrog of the two lead teams. And as we got closer, I became more and more sure that I'd seen Lake Henshaw before, and knew in fact exactly what it looked like. Sure enough, it was as I expected it—which didn't do much to quell my concerns. As we were getting closer, I kept remembering details about the place, and recalled not being terribly impressed at the time. Let's just say that in the name "Lake Henshaw Resort", the "Resort" is a bit of a liberty. While I wasn't expecting room service, double-headed showers or 1000 thread count Egyptian cotton sheets, I was expecting a few things that were plainly missing upon arrival. I'll start with what I was expecting. In reading up on the resort and simply having some natural expectations of lake-cabin-camping, I expected a peaceful, quiet setting with a handful of neighbors, fire-pits, BBQ's, and fishing on the lake—with any luck, views of the lake. I expected the kitchen to be small and the provided utensils to be pretty low quality, so I brought a few of my own pans and a butcher knife. I expected a remote location, surrounded by hiking paths and fun areas for the kids to explore. The resort advertises a pool and a playground, so I knew those would be there as well. The reality isn't that far from the expectations on paper, but somehow the arrival experience is pretty lacking. First off, the "resort" is right on the side of the highway, and the cabins are in fact just part of a much larger RV park with mostly permanent residents. It's "on" the lake, but probably a solid 10 minute walk to it—across the highway. While the highway isn't particularly busy, there was enough traffic on it even at 1am to be annoying. Laying in bed listening to the wildlife is wonderful; it being innerrupted every minute or more by a low-flying big-rig or drunk trying to break the land speed record was not ideal. And while the resort has a 10pm noise curfew, there seems to be no one to enforce it, as I actually had to get out of bed at 1am and tell the neighbors to shut the hell up as between their music, yelling and constant slamming of the screen doors, they had woken me up a few times and just woken up the kids, so enough was enough. I haven't seen the pool yet, so I'll reserve judgment on that until I do. 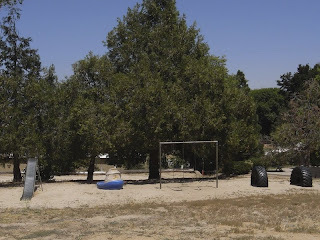 But on check-in, the lady behind the desk said quite plainly, "well the website says we have a playground but really it's just a swing-set—haha" and points to a rusty swing in the full sun that looks like about the last place to let the kids have free reign. She asks if I wanted a fire-pit and if I'd requested one; annoyed, I told her I wasn't aware I had to request one, since that wasn't on the website and no one had asked when I made the reservation. She offered to try to get one over to me, which she described as an old washing machine tub that they gut and use to contain the fire. Effective, I'm sure, but somehow just a little more redneck then I was hoping for. 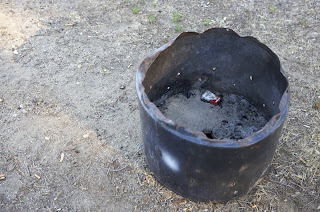 Firepit. No charge for the empty Marlboro pack. The cabin itself is actually pretty nice. We paid for a "one bedroom suite" (and we'll file the use of the word 'suite' under the same category as 'resort'), which is basically a main room with a trundle bed, couch, small table and a pretty decent kitchenette, a bedroom with a queen bed, and a bathroom with a standing shower. Towels and soap provided. The kitchen has a useful selection of pots and pans, but I'm glad I brought my own. It has a small gas stove which is always a bonus in my book, a very small sink that makes washing anything larger than a coffee cup a wet experience, a small fridge, and a coffee maker. Again the kitchen is quite useful and I'm pleased with it. So again, overall it isn't bad but I was expecting more. I'm not impressed with the proximity to the road, the noise from the neighbors, or the distance to the lake. Oh, and while you can rent a boat for $35 a day to go fishing, there's no rental of fishing poles or other required gear. There is a stand for a portable BBQ, but no BBQ's provided. There's not internet or TV which was stated on the website so expected, but there's also no cell coverage out here (even though the AT&T coverage maps says there is). There are no hiking paths around here to speak of, according to the front-desk lady; I really have to drive to get to those. All of these details would have been good to know in advance and are things they should have had on their website. 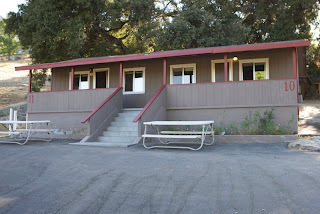 So hopefully this blog post will serve as a bit more information on Lake Henshaw Resort for future guests than they are providing themselves. Today we'll start to explore the surrounding area, as there is inner-tubing at La Jolla Indian Reservation, hiking on Mount Palomar, Tourmaline stone digging at the Himalaya Mines and the town of Julian not to far away. So off we go… five days of "roughing" it, cabin-style.